A six year-old boy is going viral on the internet for the most heartwarming reason and it is the best thing you will read about on the internet today. 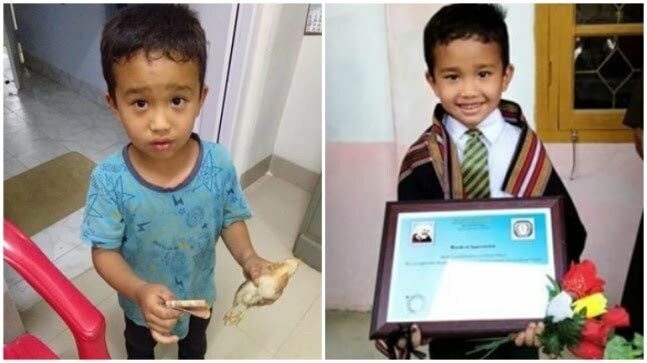 Derek C Lalchhanhima, from Mizoram, redefined humanity recently, when he innocently took an injured chicken to a hospital after he accidentally ran over it. The way Derek showed empathy and innocence towards the animal is winning over the internet. In another Facebook post, by Sanga Says, the boy can also be seen draped in a Tawlhloh Puan as he holds his award for a picture. The shawl is an honour given to those who have exemplified extraordinary courage. The post said, I guess by now you all know who this adorable kid is. Derek C Lalchhanhima (age 6) is being honoured by his school and he is draped in a shawl which is a traditional way of honouring someone among Mizos. In Mizo tradition different types of shawls are usually presented to esteemed guests and in olden days, to pasalha (braves or warriors) who have accomplished great feats. The shawl that is draped on him looks like a modified version of the "Tawlhloh Puan", an honour given to those who have exemplified extraordinary courage. We can all learn an important lesson about empathy from him. His innocence is what we need to learn in today's time.